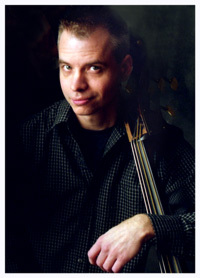 When Dennis Crouch left NBB, he recommended they talk to Andy Todd about the bass slot. Alan O'Bryant called Andy and invited him to come around and jam with the boys. A few tunes was all it took; Andy was hired in the Spring of 2005. His style was a perfect fit. Andy Todd, 38, hails from Murfreesboro, Tennessee. Live music captured Andy's interest early in life. He picked up a banjo when he was around eleven and by the time he was a teenager, he was entering regional contests. It was an inspiring environment and Andy soaked up acoustic music for all he was worth. He's been a sought-after sideman ever since. Directly after high school, Andy went to trade school and worked in a machine shop. During this time, he met a man named Jim Grainger, an instrument repairman in Sparta. On weekends Andy would drive out there to hang out and learn about instrument repair, something he was becoming more and more interested in. He's since built a couple guitars. And lots and lots of banjos. From 1999-2006, Andy worked with Steve Huber building banjos. Then in 2006, he decided to start his own repair and restoration business. These days Andy's renting workspace from master luthier Marty Lanham at the Nashville Guitar Company in Inglewood where he does instrument set-up and repair, and restoration work. While he plays excellent bluegrass guitar and banjo, Andy is becoming most well known for his warm, steady, complimentary bass work. Andy picked up the upright bass in 1990 when a band he was in needed it covered. Self-taught, Andy studied the work of Roy Huskey, Jr., Junior Huskey, Bob Moore, Jake Tullock, and Lightnin' Chance to get it right. He developed a good ear for the instrument and over time built the necessary stability and strength in his hands. Reflecting on how he got hooked on playing music, Andy speaks of his Great Uncle Elmer Smith, a hobby musician who encouraged Andy to play. Uncle Elmer dragged Andy to festivals and nursing homes, making him to play in front of people. Bluegrass veteran Carl Tipton and his family were also encouraging, often inviting Andy to play banjo with them. “In the mid-eighties my very first road trip was to open for Carl Tipton. What an honor that was! And I got to work a lot with Sophie and Louise after Carl died,” Andy said. Over the years, Andy's performed with the Roland White Band, Traylor Parker, Pam Gadd, Charlie Sizemore, Del McCoury, Harley Allen, and Dave Peterson & 1946. He's played at the famous Carter Family Fold and many times at the Ryman Auditorium and the World Famous Station Inn. He worked on the critically acclaimed Moody Bluegrass CD project and appears on the soon-to-be-released Moody Bluegrass II. He is invited to do a lot of session work as well, for Alan O'Bryant's OBanyon's Terrace Studio and other like it. Like other NBB band members, Andy has a fondness for vintage instruments. He has a small collection of old guitars that he says “need work that I don't have time to do.” Last year he uncovered a new, related interest when he ran across a couple Victor Victrolas from the 1910s, which he happily restored. The Nashville Bluegrass Band has been a comfortable stopping place for Andy. “Everybody gets along incredibly well,” Andy says. He's enjoying traveling with NBB, citing countless festivals, two trips to Europe and a thrilling opportunity to perform at the White House. Andy lives in Donelson, Tennessee, with his dog, Grady. He loves Kay basses and owns two. His favorite is a 1939 Kay that he bought from some friends a few years back.